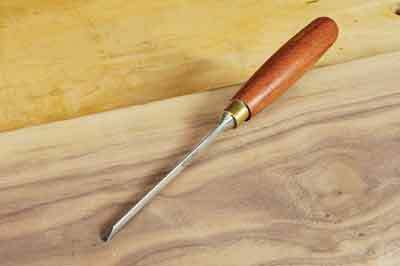 I've had it in mind to try out the Ashley Iles dovetail chisels for some time now but never quite got round to it. This month's deconstruct article is all about the indelible imprint we leave on our work, and required a fine chisel to recreate the small through dovetails on a drawer thought to have been made in the workshops of London cabinetmakers Mayhew & Ince during the latter part of the 18th century. Short of regrinding an old chisel to suit, it was going to prove difficult. The larger chisels in this range - up to 25mm - have rounded faces to achieve a shoulderless side edge, which is capable of accessing the tighter recesses of your joints. At 3mm, though, the face profile changes slightly to more of a trapezoidal section with similar advantages. There's no substitute for having the right tool for the job and this tool definitely delivers.